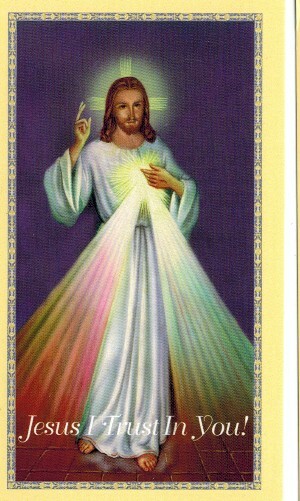 Directions for the Divine Mercy chaplet on the back. paper card stock. The Chaplet of Divine Mercy (for private recitation on ordinary rosary beads) Our Father...., Hail Mary..., the Apostles' Creed. Then, on the Our Father beads you will say the following words: Eternal Father, I offer You the Body and Blood, Soul and Divinity of Your dearly beloved Son, Our Lod Jesus Christ, in atonement for our sins and those of the whole world. On the Hail Mary beads you will say the following words; For the sake of His sorrowful Passion, have mercy on us and on the whole world. In conclusion three times you will recite these words; Holy God, Holy Mighty One, Holy Immortal One, have mercy on us and on the whole world. "The Chaplet of The Divine Mercy" is excerpted from Divine Mercy in My Soul: The Diary of Blessed Faustina M. Kowalska, copyright 1987, The Congregation of Marians, Stockbridge, MA 01263; printed with permission. size: 4" by 3"